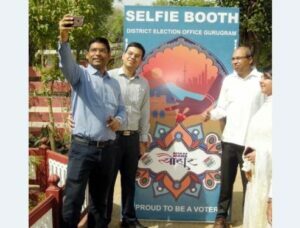 India’s first-of-its-kind ‘Voter Park’ was inaugurated in Gurugram, Haryana, aimed at increasing voter awareness and educating people about the electoral process. Haryana Chief Electoral Officer Rajeev Ranjan inaugurated the park. The objective of establishing Voter Park was also to motivate eligible people to vote in the Lok Sabha election so that they can contribute to the progress of the country.